How Does the Campaign Works? The 6-week fundraising campaign provides an opportunity for local organizations, schools, churches, and community groups to raise money for their programs and for individuals, businesses, and social groups to support the nonprofit of their choice at a high visibility community-wide event. During the campaign the Volunteer Center of Santa Cruz County will provide ongoing support with the free online fundraising website, training with top development experts, connections to supporters, weekly incentive prizes, and we manage all of the main event marketing so you can focus on your fundraising goals. While most participating agencies utilize our online fundraising platform, some choose to go old school with good old fashion paper pledges. Learn more about the paper pledge gathering process. The campaign culminates with a community celebration on Race Day- May 11, 2019. Race Day consists of a walk and fun run, complimentary breakfast and lunch, music, games, street performers, gifts and prizes after the event. How Much Does Your Agency Earn? Participating agencies earn a minimum of 75% of all pledges collected.You can increase the percentage by bringing in $10,000 or more. The table explains how higher collections translate into a higher percentage of earning for your agency. The Volunteer Center retains the remaining balance to cover administrative and event management costs. As ambassadors for your organization, your board and volunteer engagement in the Human Race is a crucial element for success. What roles will you ask them to take for your campaign? Check out the Board Engagement resource here. What will be your goal for board and fundraiser giving? What donor engagement strategies will your board and fundraisers employ? What social media/marketing activities will you ask of your fundraisers? What other tasks or strategies would you like your board or fundraisers to participate in? Stewarding your donors – before, during and after the Human Race – keeps them aligned with your organization for continued engagement and support. Goals for the Human Race can be more than financial. Manage your expectations for setting your overall philanthropic goals: new donors, visibility, marketing, social media. What is your financial goal for the Human Race? How many donors would you like during the Human Race? Once you’ve defined your audience, crafted your message, and set goals, be sure to maximize the communication tools available to you. A press release can provide a broad overview, email marketing and traditional marketing can engage existing volunteers and donors, and don’t forget to use your board, volunteers, staff and fundraisers as effective community ambassadors. Use what works best for you! What tools are you not using that you may want to incorporate for the Human Race? What current marketing materials can you add your Human Race message to? What social media platforms will you use for the Human Race? Now that you’ve answered some key questions let’s put it all together. Use the tools in the Non-Profit Toolkit and attend our trainings to support your work plan. 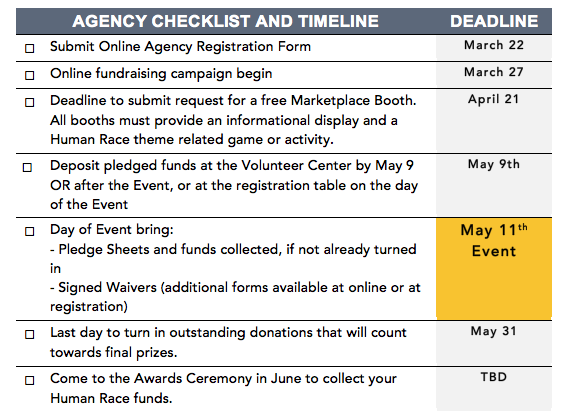 The month prior to the Human Race Campaign Kick-off should be dedicated to planning and preparation, so that you are ready to implement your plan starting on March 27th; starting with soft marketing and then transitioning into heavy marketing at the 3 week mid-campaign mark.